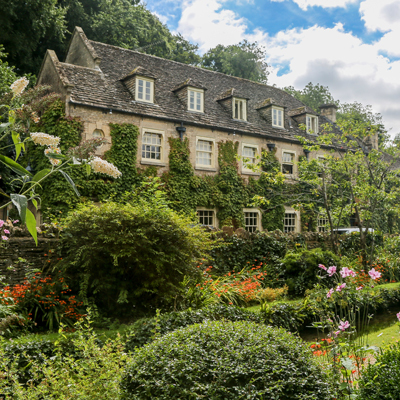 Elmore Court is the 750-year-old Grade II* listed home of the Guise family nestled in a beautiful rural village between the Cotswolds and Bristol. 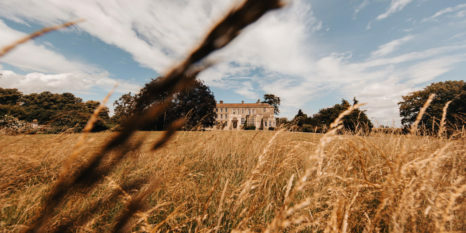 This ancient historical home with views of the River Severn has been renovated into a self-sustainable state-of-the-art Wedding Venue including a biomass heating system and naturally built super marquee, the ‘Gillyflower’. It was 1262 when the family Guise was first granted the Elmore Estate by nobleman John de Burgh with the rent being a nominal ‘clove of Gillyflower’ each year. The current Guise’s, Anselm and Sarah, have taken their combined 35 years of experience in the music and events industries and turned Elmore into something that makes the best of their skills and passions whilst maintaining tradition and keeping the incredible history alive. Unlike many grand historical houses, Elmore Court was not built for military, religious or ostentatious purposes. It was built as a functional homestead for family use and the entertaining of guests. Everybody who has come to stay in the house has felt the unique warmth and energy of the building. Many have commented on there being a certain magic about the place when it is being used for bringing people together; although, this allure can be partially attributed to the kind and welcoming natures of Anselm and Sarah. There are four stunning ceremony and reception areas in the main house, the primary one being the Hall – the heart of the house, and an ideal location for a ceremony for up to 150 seated (and 50 standing) guests. The Drawing Room, The Morning Room and The Porch (the front steps of the house useable for an outdoor ceremony) make up the other three licensed ceremony areas. For accommodation, there are 9 rooms all with their own unique character. These include the oak-panelled Master Suite with a Caesar size bed; en-suite facilities and a double bedroom attached which can also be used as a bridal dressing room. There are 7 more bedrooms including the fantastic Oak Room with its 350-year-old 4-poster bed and freestanding copper bath. Every room has been carefully modernized, then individually styled and redecorated by Sarah and Anselm to maintain the traditional feel of the house and inspire guests with their inventive attention to detail. The total sleeping capacity is 22 persons, with the option of supplementary single beds being added. All rooms include their carefully selected all-you-can-eat breakfast menu; consisting of the classic full English alongside yoghurts, mueslis, cereals, fruits and pastries. Everything is high quality, free range and locally sourced as far as possible. An environmentally sustainable ethos is the foundation of operations at Elmore. The Gillyflower has been built using earth and timber from the Estate and a newly installed Biomass boiler heats both the house and Gillyflower using wood from the estate. In-house catering is an exceptional offer, with food being sourced locally as well as from the kitchen garden. There is a “grow-to-order” option if booked well in advance. 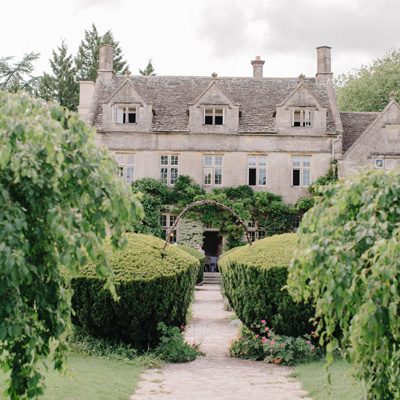 Whilst the focus is on how to make the most of your celebration during your stay, the intent is to get back to the basics of how a traditional country estate was run. The vision is that the House, Gardens and Estate will all work together to become shining example of low impact, self-sufficiency, without compromising on comfort and style. The jewel in Elmore’s swan-topped crown is The Gillyflower. It truly represents everything that this generation of the Guise family is trying to accomplish. These festival-minded souls take the greatest pleasure in seeing you and your guests have the wedding ceremony and party of your dreams. Within the house they celebrate tradition, while in the Gillyflower they embrace innovation and evolution. The Gillyflower boasts a 200-seated dinner capacity and up to 400-dancing to the custom-made Funktion-One AmbiSonic Sound System; designed to have a specific set of features to make it perfect for weddings and events. The circular speaker layout means the sound can be contained within the dance-floor space so those who don’t feel like dancing can still converse with ease and observe the frolics of others in comfort, which is perfect for the older generation who may not like the music or its volume! Meanwhile, those on the dance-floor are treated to a sound quality worthy of any club in the world. The sound can also be calibrated to fill the whole space should you want to crank things up to a proper wall-of-sound party vibe. The building is fully soundproofed so any early sleepers in the house will not be disturbed by the music. A unique fiber-optic lighting system designed and installed by Bruce Munro adorns the Gillyflower. There are huge seated windows with views over woodland and the Cotswolds. Outside, in full view of the Gillyflower, is a cosy fire pit with paths leading off through the wild meadow to a huge area for boutique camping. The Gillyflower is constructed from local estate farmed timber and rammed-earth walls, which are hidden behind ‘living walls’ consisting of Ivy, Virginia Creepers and other beautiful climbing plants. Hi-speed wi-fi, biomass-powered air conditioning, a premium built-in bar, a catering marquee and an in-house events manager ensure this is the most complete and cutting-edge country-wedding venue available in the UK today. After that write-up you simply must indulge in the Gallery… This is one epic Wedding Venue folks.